Thanksgiving Sermon: "Receiving, Remembering, Rejoicing"
Anyone who’s spent time around children –teachers, moms or dads –they’ll all tell you that when you set out to teach children the roles quickly reverse. The student becomes the teacher; teacher a student. Sometimes I like to live “dangerously”, so this week during Preschool chapel I asked the children what they were thankful for. Markers, Cupcakes, Flowers, Moms and Dads, Ninja Turtles, Teachers, Jesus, Shoes, Turkey, and on and on they went. Adorable to be sure. But that’s not the point. I believe that God had made me and all creatures; that he has given me my body and soul, eyes, ears, and all my members, my reason and all my senses, and still takes care of them. He also gives me clothing and shoes, food and drink, house and home, wife and children, land, animals, and all I have. He richly and daily provides me with all that I need to support this body and life. It wasn’t just in what they were saying, but how they were saying it. Turns out we can learn a lot from children about thanksgiving. Thanksgiving is about: receiving, remembering, rejoicing. Through the children of Israel, God teaches us the same thing. And it all begins with receiving. Everything Israel had was a gift from YHWH: the Promised Land, the manna and quail, their shelters, clothes, and sandals– all gift. Israel’s identity as God’s people, a holy nation –was also gift. The Passover, Exodus from slavery, the promise to send a savior from sin and death – all of it gift. Oh give thanks to the Lord for he is good, and his steadfast love endures forever. The Lord did all of this for Israel, not because they deserved it – quite the opposite actually. Israel was a stiff-necked, ungrateful, rebellious child. No, God did not love Israel because they were good or because they said “thank you”. God loved Israel because that’s who he is. He is love. And he shows love. God rescues. God redeems. God sent prophet after prophet. God sent a Savior. He did all of this out of fatherly, divine goodness and mercy, without any merit or worthiness in them. If our earthly parents provide for such basic things as a home, clothing, and food, then your Heavenly Father gives you more. He is more faithful and devoted to your well-being. He loves you not because you are good - like Israel, we’re stiff-necked, ungrateful, rebellious children of Adam. God does not love us because we say thank you. God loves you because that’s who he is. He is love. He shows his love in this manner. While you were still a sinner, while you hated and rebelled, kicked and threw an unholy tantrum, Christ died for you. God sent his Son. The way God loves you is seen on the cross. To be a child means to receive what our parents give. We live in their house, eat at their table, wear the clothes they buy, and enjoy the gifts they give. It’s not a one-time thing. Though our parents might’ve joked about never feeding us again, they always did. So it is with our heavenly Father. He makes you his child in baptism. You’re adopted through Jesus’ death. You live in his house, the church. You eat Jesus’ body and blood at his table, and you enjoy his gifts of body and soul. He does all of this out of fatherly, divine goodness and mercy, without any merit or worthiness in us. Everything we have is a gift. And so we thank because of all he has given us. God’s delight is to provide for you in His house, and in yours. Your roof, bed, table, toilet paper, microfiber brushes, bacon, turkey, stuffing: they’re all gifts from his hands to you. God gives; you receive. And in receiving you remember. Thanksgiving is also about remembering. Like Israel we grow complacent. We forget God’s Word and promises and look to ourselves. That’s how sin works: self-centered, curved inward. We live in the wilderness. We face sin and death within; and without. Hunger, sickness, and weeping accompany our journey. Empty chairs at the table mark the place of loved ones who’ve died. We watch a little football or an early Christmas movie just to escape the news: Ferguson burning. ISIS beheading. The whole world collapsing around us. These are signs of a fallen world. And though we’re often tested in the wilderness, you are not forsaken. We may forget the Lord, but he never forgets you. We may forsake his Word, but he never forsakes his promises to you. And neither should we forsake one another. Remember your family members in need: invite them to dinner, go out for coffee; call or write. Remember your fellow brothers and sisters in Christ; think about who you haven’t seen in the pews next to you lately; give them a call; write a card; ask them how they’re doing. How can we remember God’s promises and neglect those in need? Thanksgiving is about remembering: remembering God’s promises and remembering all who are in. And in remembering we rejoice. 7 For the Lord your God is bringing you into a good land, a land of brooks of water, of fountains and springs, flowing out in the valleys and hills, 8 a land of wheat and barley, of vines and fig trees and pomegranates, a land of olive trees and honey, 9 a land in which you will eat bread without scarcity, in which you will lack nothing, a land whose stones are iron, and out of whose hills you can dig copper. 10 And you shall eat and be full, and you shall bless the Lord your God for the good land he has given you. One of the best ways to rejoice is to receive and remember what the Lord gives you. So, one of the best ways to give thanks to God is to be faithful in receiving his gifts, for God is a cheerful giver. That’s why he gave Israel a promised land. But as good as that land was it was only a glimpse of a better country, only a foretaste of a greater feast. The Lord’s promised land wasn’t to be found in the deadly dust of the wilderness, or in the fertile soil of the Jordan River valley, but in the flesh and blood of the God-Man, Jesus. Jesus is the perfect son of Israel for all of us stiff-necked, ungrateful, rebellious children. Jesus was careful to keep the whole commandment that God gave us to do; but he obeyed every command perfectly, all for you. Jesus was tested in the wilderness for you. Jesus was faithful to his heavenly Father for you. Jesus remembered every letter, word, and promise of God for you. Jesus was stripped of clothing and crucified for you. Jesus was humbled, even to the point of death on the cross for you. Jesus walked into a land of death to make his cross a life-giving tree for you. 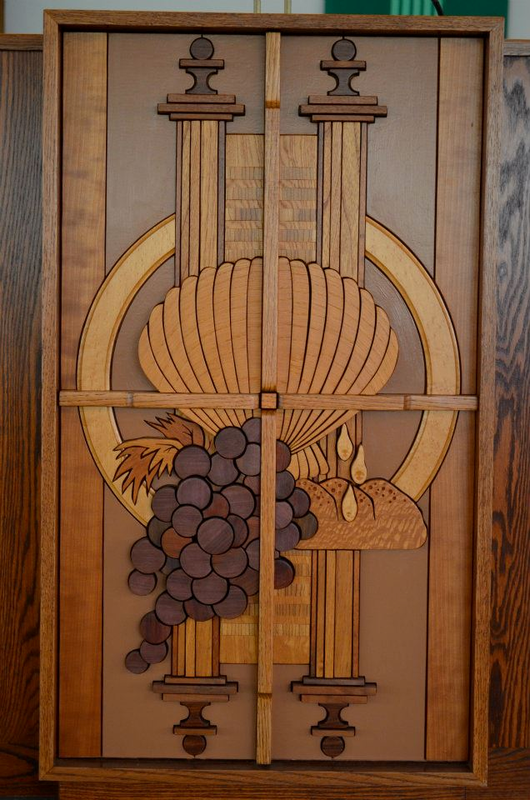 Jesus bore the fruit of our iniquity to give to you the fruit of his victory in the Lord's Supper. Jesus rose from the grave to bring you into a land where you will eat and drink without scarcity. And you will lack nothing. An eternity of receiving, remembering, and rejoicing in Christ. 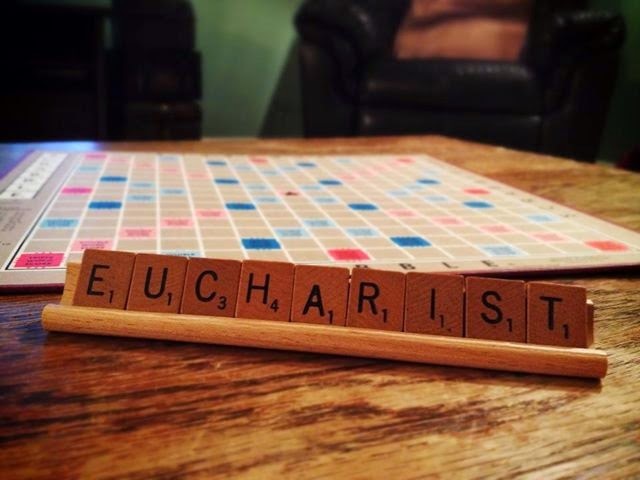 For you do not live by bread alone, but by every promise poured over you in Baptism, by every Word of absolution spoken to you, by every Lord’s Supper you receive; and by every Word that comes from the mouth of the Lord, on Thanksgiving day, and always. That’s the Christian life: receiving, remembering, rejoicing. It begins with receiving, ends with rejoicing, and starts all over again. Kind of like most thanksgiving dinners Christ’s grace just keeps on coming. So enjoy all the Lord has given you. Share your stories. Laugh. Cry. Sort the dark meat and light meat. Praise the Lord and pass the gravy boat. I wrote this up a few weeks ago for the beginning of KFUO's 90 days of celebrating 90 years of being the Messenger of Good News. Enjoy! The tribute piece before you is made entirely out of Lego bricks, 1,223 pieces to be exact! It all began in August when KFUO Director, Rev. 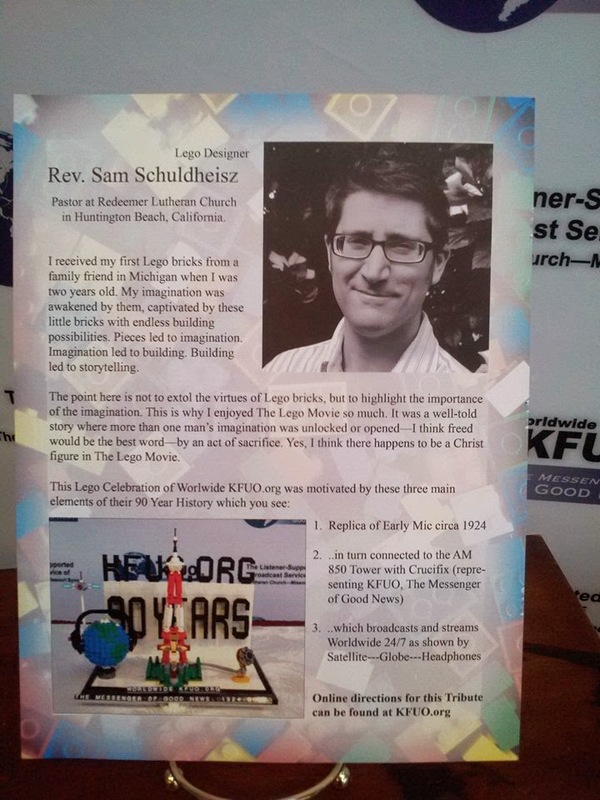 Rod Zwonitzer, first approached me with the idea of making a contribution out of Lego bricks for the upcoming anniversary festivities at KFUO. What a joy it was to have the opportunity to share one of my favorite childhood toys and hobbies with in service to the great work that KFUO continues to do as the messenger of Good News. Before describing each of the elements individually, let me briefly share with you the building process that began with paper and a little imagination, and finished with real Lego bricks. In sharing correspondence with Rev. Zwonitzer and the KFUO team we each came up with a variety of ideas: satellites and globes with headphones, lettering and the slogan for KFUO, and so forth. With my imagination in high gear, I started jotting down notes and making sketches. As you can tell from the photo, I am a much better Lego artist than I am a paper-and-pen artist. Anyhow, before long, these rough sketches turned into computer designs. Using a program called Lego Digital Designer (a free program from the Lego Group), I was able to create a list of pieces needed for final assembly, as well as a basic instruction manual to guide anyone who might want to build their own replica of the tribute project. Once the digital designs, the lists of pieces, and the instruction manuals were completed, I was then able to order the parts. A majority of the parts for the final build came from the Lego Pick-A-Brick website. However, a few of the more rare pieces (such as the gold on the microphone) had to be specially ordered from third party Lego retailers on EBay. After all the parts finally arrived it was time to prepare for the build. First, the pieces were sorted by color and size. Next, I used the electronic instructions from Lego Digital Design to construct the more complex components of the project. Finally, each completed component was placed onto its resting spot upon the white and black display frame before photographing and sending it off to St. Louis! In order to accommodate all the fantastic ideas that we had come up with, I needed a platform for display. The lettering “KFUO.ORG” across the top ended up determining the size of the overall display frame and support system. Black and white colored bricks were chosen to highlight the contrast of the lettering as well as the other design elements once they were placed on top. The back of the display also bears the “90 YEARS” marking the occasion of the KFUO anniversary in boldness, reflecting the boldness of the Gospel proclamation. The lettering on the display also features the website as a quick reference for a visual reminder to check out the KFUO website. The smooth white surface on the bottom of the display was achieved by a technique known as Studs Not On Top (or SNOT for short). This gives it a clean look and provides a great backdrop for the other elements. After the backdrop was completed, the microphone was the next element to be designed. 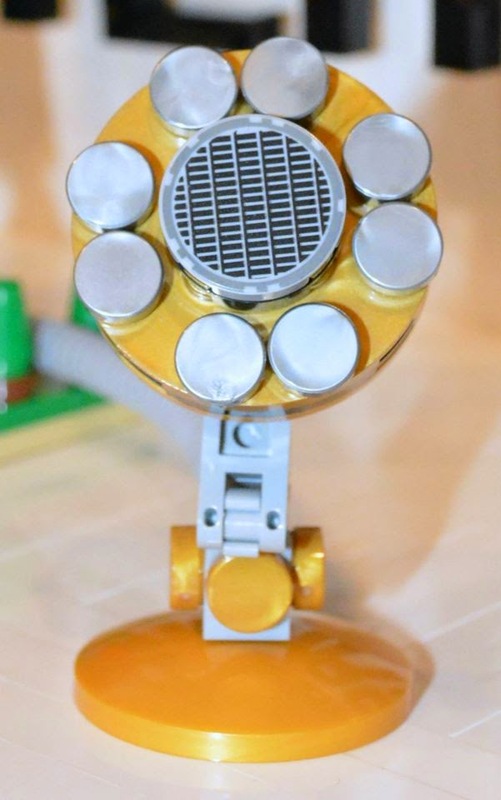 The inspiration for this micro-scale microphone came from the old, iconic KFUO mic, used by Rev. Walter Maier, the first voice of KFUO radio. 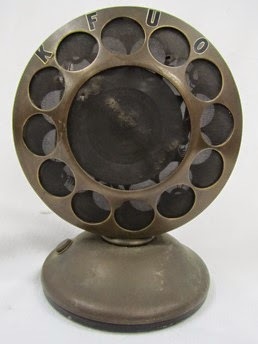 The idea was to connect this important historical artifact to a tower showcasing the roots of KFUO radio and their pioneering work in proclaiming the Good News on the airwaves, and the technology used in broadcasting. In order to connect the microphone to the radio tower, the tower needed a platform. I constructed a simple greenway that would be the ground and landscape under the tower as well as the base for the crucifix. The platform features micro-scale trees and green grass designed to accent the radio tower. At first glance, the radio tower might appear to resemble every other ordinary radio transmitter. But actually, it was designed to reflect the original KFUO radio tower that still stands in operation on the grounds of Concordia Seminary St. Louis. In the foreground of the greenway, directly in front of the radio tower, stands the crucifix, giving a visual and theological focal point to the entire build. In the 90 years of its existence, the work of KFUO has been to proclaim Christ crucified and risen to all and for all. 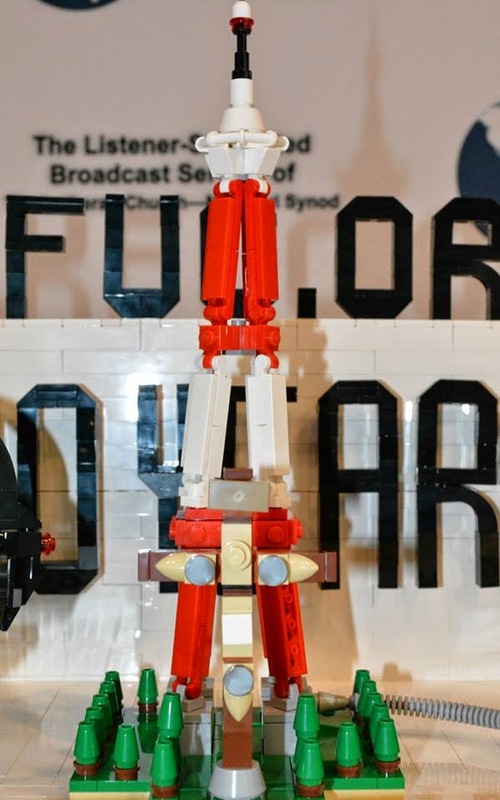 Christ crucified is the center of all we say and do in the Lutheran church, and it’s no different when it comes to Lutheran Lego projects. Despite its size and simplicity, this element was one of the most challenging to design. The balance that needed to be struck was between contrived and too abstract. 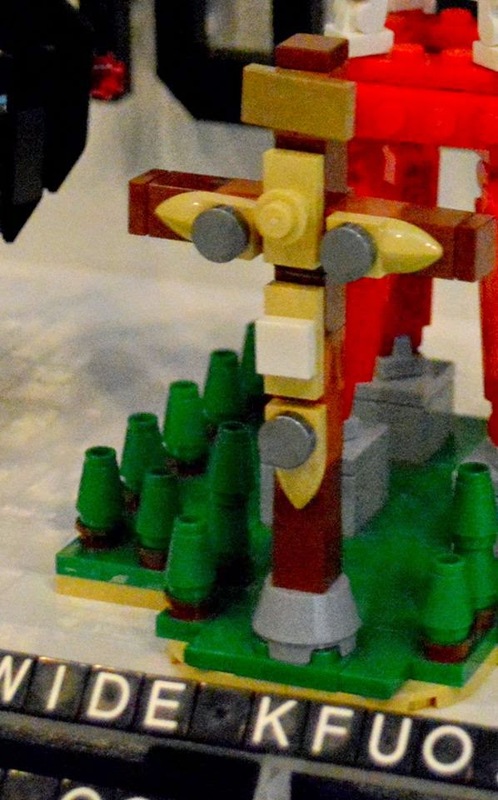 For example, a Lego mini-figure on a cross would not fit with the over-all design, nor would it have displayed reverence. On the other hand, a plain cross, or one that was too stylized, would not communicate the message of Good News as clearly. So, I tried to stay with an artistic rendering of the cross while still designing a crucifix that clearly reflected our theology. After the challenge of the crucifix, the next biggest task was to include a globe capturing the “WORLDWIDE” slogan of Worldwide KFUO. 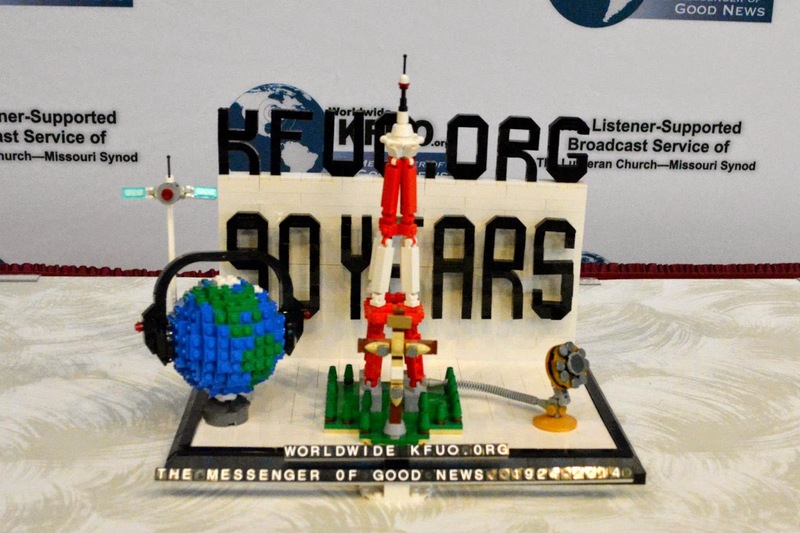 Since Christ Jesus came into the world in order to die for the life of the world, it made sense to have a globe, pointing to the Good News that is broadcast worldwide from KFUO. 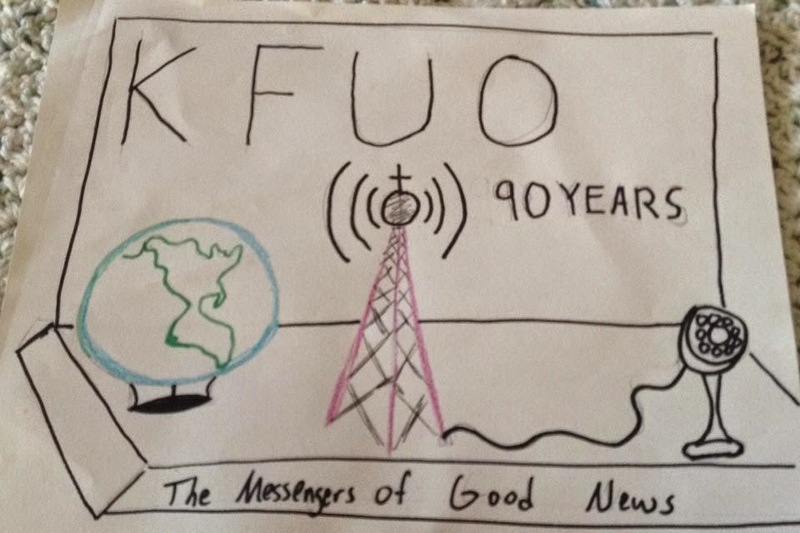 In addition to the globe, we came up with the idea of having headphones and a satellite attached to it, giving a visual nod to the advance in broadcast technology over the years, as well as displaying the modern ways in which KFUO continues to be the messengers of good news in the 21st century. In other words, KFUO uses new technology, but clearly proclaims the same old, saving theology of the cross to all who tune in, no matter what technology or receiving device they're using. Finally, in front of the display and design elements rests a simple stand with the lettering depicting the KFUO slogan: “Worldwide KFUO.ORG. The Messenger of Good News since 1924.” These little tiles with lettering are also quite rare. However, they can be found in the Lego kit that is titled Lego Business Card Holder. In all the build used 1,223 pieces. 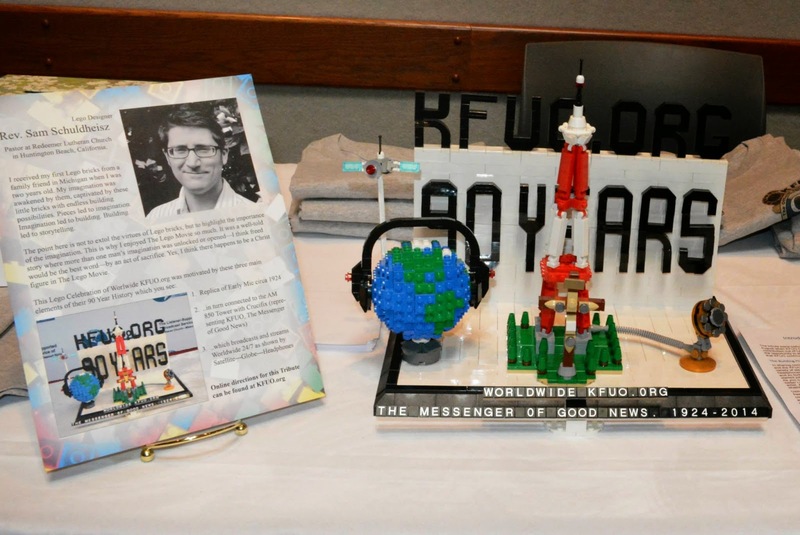 And it was a ton of fun for me to design, build, and send this off for the KFUO 90th anniversary kick-off celebration. I pray that KFUO continues to be the messengers of Good News in the next 90 years as well. Background / Display Frame including lettering: 647 pieces. Radio Tower, Greenway, and Crucifix: 240 pieces. 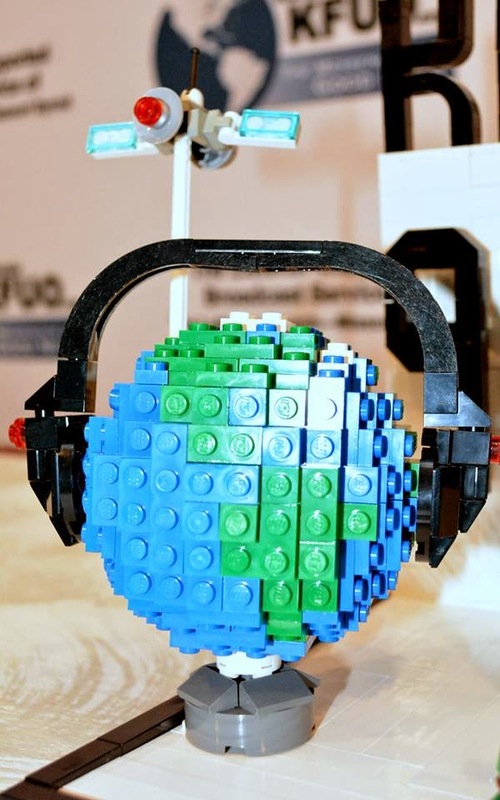 Globe w/ Headphones and Satellite: 236 pieces. Front Display Stand w/ Tiled Lettering: 73 pieces. This Lego build was designed and planned to be something that family and friends, supporters of KFUO, or anyone interested could download the building instructions and build either part or all of this display model. This would be even easier for someone who already has Lego bricks around the house. If followed, the instructions will make for a wonderful building experience and a delightful conversation piece when you’re finished. But, Lego instructions are also meant to be creative tools, allowing the builder to expand or make new creations, using different pieces, colors, or designs. My hope is that anyone who sets out to build any part of this tribute model will enjoy it as much as I have. When ordering Lego bricks for this project I used the following proprietors, though this is not an exhaustive list. Costs per piece may vary depending on the company, seller, and their location. Follow the links below to visit the websites I used in constructing the KFUO Anniversary Build. 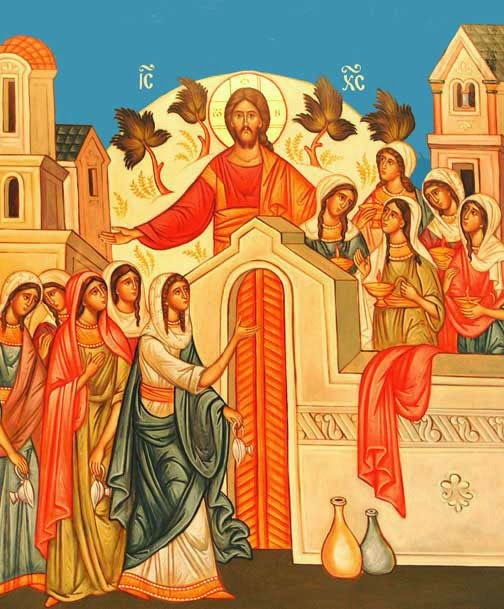 Pentecost 22 Sermon: "God Loves A Party"
If there’s one thing you can tell from hearing Jesus’ parables, it’s that God loves a party. Time and time again, Jesus teaches about a wedding feast, a great banquet, or a Master who threw a party. God is shown as a gracious, abundant host. Heaven is a grand feast – fine wines and rich food. And all are invited. Today’s parable of the Wise and Foolish Virgins is no exception. 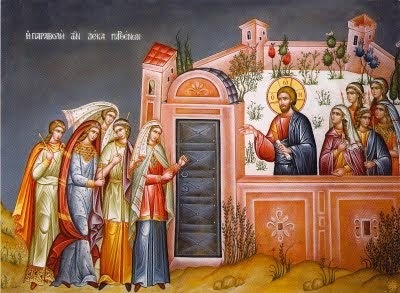 Then the kingdom of heaven will be like ten virgins who took their lamps and went to meet the bridegroom. Where are these 10 young ladies heading? A party. Why? Because there’s a bridegroom. And where there’s a bridegroom there’s a wedding. And where there’s a wedding, there’s a feast. This is Jesus’ way of talking about the end-times. The Day of the Lord is near. The Bridegroom is coming! Jesus spends a good amount of time during Holy Week dishing up three end-times parables for his disciples, leading up to the main course: his own death and resurrection. His crucifixion signals the beginning of the end. But an end we need not fear, because Christ has been judged in our place. And so the church follows her Lord; these last three Sundays of the church year feature an extra portion of end-times teaching. Jesus teaches us that his coming will be at an unknown and unexpected time; that Christ’s return – like the Bridegroom in the parable - is delayed; and therefore we should be ready, watchful, and awake in anticipation of Jesus’ coming. For his coming is a joyous occasion. Jesus’ parable prepares you for his coming. Prepares you for the party. After all, God doesn’t want a party of one. Our heavenly Father is the God of fellowship. His party needs guests and people to receive and rejoice in his saving gifts. Five of them were foolish, and five were wise. For when the foolish took their lamps, they took no oil with them, but the wise took flasks of oil with their lamps. Notice that even before the description of “wise” or “foolish” is given, they’re all invited. Jesus’ heavenly banquet, Christ’s death and resurrection that leads to eternal life, is for all people. It would be foolish to reject such a gift. And yet that’s precisely what Scripture says happens. Such is the way of folly in this sinful world. The foolish look cool and confident. The wise ones look foolish to the world. We who trust in the Christ, the Bridegroom and have faith in is return are mocked and ridiculed. Because we long for a better party in heaven we are called fools or worse. And so we’re tempted to join the foolish girls club. We delude ourselves with the world’s wisdom: “Oh, it’s fine; I’ll repent later.” But our foolishness goes deeper. We delight in the wisdom of the world because it’s easier to live that way, and if we’re honest, more enjoyable too. We love our sin. We enjoy living foolishly. We want to get along better with the world; we want the foolish girls to like us. What foolishness. Later may never come. There is a point of no return, when it’s too late, when the Gospel is no longer preached; a time when you can’t go and get oil, when the doors will be shut forever. Five virgins fall asleep and are shut out. Repent. The Bridegroom is coming. Everyone is surprised by the Bridegroom’s midnight arrival. It’s unexpected and unknowable. Who would’ve figured that the Bridegroom would be delayed? Who would’ve figured that the bridegroom would show up at the crazy hour of midnight? That’s no time for a wedding party. Like the Bridegroom’s arrival, Jesus return is also unexpected and unknowable. You neither know the day nor the hour. Jesus’ return may be delayed, but he will come. There will be an end. The Bridegroom is coming. It’s the Bridegroom’s arrival that shows the wise and the foolish for who they truly are. Finally, when the Bridegroom arrives, the wisdom of the wise and faithful is apparent. They had oil to spare. They lived in expectation of the wedding party. They let nothing get in the way, including those terribly unfashionable bottles of oil they were toting along with their purses. They listened to the word of the Bridegroom. They looked and longed for his arrival. Not so the foolish girls. They look to their own readiness and lamps. The foolishness of the unbelieving is also revealed as they run around looking for oil that can’t be found, and finding a closed door to a wedding party at which they had a place. How sad! How foolish! How unnecessary! They had trimmed their lamps. Their lamps were low but they were burning. Had they not heard that the Lord would not snuff out a smoldering wick? The problem wasn’t the oil or the lamps. It was that they did not trust the cry that the Bridegroom was really coming. They had everything they needed to greet the Bridegroom and go in. Their lamps were burning even though they were low, but they refused to believe it was enough. They had a place at the wedding party. Christ died for all without exception. They had a seat at the table with their name on it. They were invited to the party. And yet in their foolish figuring, they lost out, they are unrecognized. The door is shut. “I don’t know you.” They sought to prepare themselves to meet Him by their own means, they did not dare to meet Him in their foolishness. This is the height of folly. The wise, on the other hand, believe the cry. They rise to meet the Bridegroom with rejoicing despite their failure to keep watch. They do look not at their own readiness or their lamps. They look to the Bridegroom and He keeps their lamps burning. They trust the Bridegroom. He will bring them in. This is partly why Jesus teaches us about the end times. It’s a warning. Yes, the Bridegroom is delayed. But Jesus will return. The Bridegroom is coming, and soon. When? We don’t know. Watch therefore, for you know neither the day nor the hour. But Jesus’ end-times teaching also a gives us a great promise…Just as Paul says: Christ died and rose again, even so through Jesus God will raise the dead when he returns in glory…and we will always be with the Lord. The world’s end may look and sound terrifying but not for you who are in Christ. For you it is joy. We welcome and pray for Christ’s return. We wait in eager expectation for the Bridegroom. And where there’s the Bridegroom there’s a wedding. And where there’s a wedding there’s a party. God is the consummate party planner. Everything is prepared. God has spared no expense. He has given his costliest gift for you, His Son. Your invitation is sent by the Father, penned in the crimson ink of Christ’s blood, and sealed by the Holy Spirit. It is the wisdom of the crucified Jesus that saves you. It is the wisdom of his death and resurrection that makes you one of his wise ones, preparing you for His return. A bleeding, suffering, dying man on a cross may look like utter folly to the world, but there is God reveals his greatest wisdom and your great salvation. There Christ becomes the fool to give you his wisdom. There Christ becomes your sin to give you his righteousness. There Christ, the Bridegroom lays down his life to make you his bride, pure and without blemish, holy in his sight. 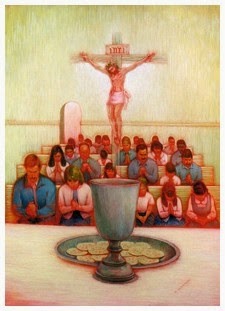 Christ’s death for you guarantees your place at the table. Your name is on the guest list. You’re in – just like the 5 wise girls – by grace alone. Behold, the Bridegroom is here. Come and meet him.